Unlimited access to our HD webcam streaming Manchester airport arrivals for only £3/mth. Catch the planes, miss the weather! Sign up and start spotting! 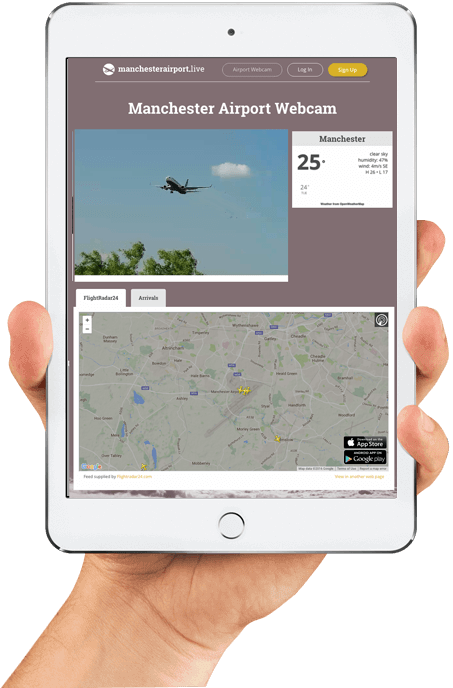 For just £3 per month you get unlimited access to our exclusive webcam feed of Manchester airports arrivals. Even better, there are no contracts so you can cancel at any time. We know it’s all about the view so we bagged us the perfect spot to see each new arrival in detail with full permission from Manchester Airport in glorious 720p HD and audio. We’ve integrated a few extras to help you get the most out of your airport live feed. For less than a coffee a month get unlimited access to Manchester Airports arrivals. No contract. Just carefree plane spotting. © 2019 Manchester Airport Live.